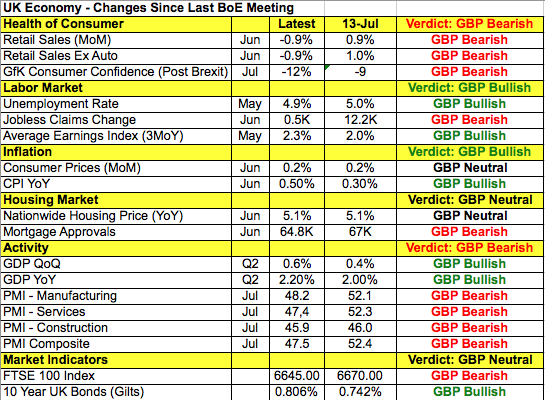 GBP: BoE Meets, Rate Cut and QE? There are 2 major event risks this week – tomorrow’s Bank of England meeting and Friday’s U.S. non-farm payrolls report. Back in July, U.K. policymakers made their plans to ease in August abundantly clear and now that the time has come, sterling has been surprisingly stable. By giving investors sufficient warning, the market had the opportunity to completely discount a 25bp rate cut and the question now is if the BoE will do more. They could cut interest rates by 50bp or they could combine a quarter point cut with renewed bond buying. Quantitative Easing was a critical part of the BoE’s monetary policy during the financial crisis but with interest rates already so low, the effectiveness of QE is in question. Many economists believe they will revive the program but not this week. Since Britain decided to leave the European Union, the Bank of England has taken major steps to stabilize the financial markets and encourage lending – and so far it has worked! Stocks are stable, yields have increased and the doomsday sentiment in the market is fading. A lot of this has to do with the U.K. government’s decision to postpone invoking Article 50 for the next year or two, reducing the immediate risk for businesses. This means the central bank can wait to ease again when there is a greater evidence of a deep contraction in the economy. Taking a look at the table below, there’s certainly been more deterioration than improvement in the U.K. economy since the July monetary policy meeting. However wages are up, the unemployment rate is down and consumer prices are ticking higher. Second quarter GDP growth was also better than expected. Although manufacturing, services and the composite PMI indices fell sharply in July, this morning’s numbers were not revised lower after the flash release. When the Bank of England releases their Quarterly Inflation Report tomorrow, their forecasts will be grim – policymakers previously warned of a possible recession post Brexit. Governor Mark Carney won’t have anything positive to say outside of acknowledging financial market stabilization. Yet economic and financial conditions are not desperate enough for the Bank of England to rekindle their QE program. Meanwhile the U.S. dollar traded higher against most of the major currencies despite a weaker than expected ISM report. Service sector activity slowed in the month of July and the employment component of the report also declined. This along with the slightly higher but still low ADP reading signals weaker job growth in July compared to June. Of course a softer NFP number is not a stretch for the imagination given the strong reading last month but investors are itching for a reason to sell dollars and NFPs could give them just that. Jobless claims, factory orders and durable goods are scheduled for release on Thursday. These reports will take a back seat to BoE and risk appetite. Having fallen sharply on Tuesday, USD/JPY appears to be finding a bottom above 101. EUR/USD also declined, dropping back below the 50-day SMA despite an upward revision to service sector PMIs. The move was driven entirely by U.S. dollar strength but tomorrow should trade primarily on EURGBP flows. The worst performing currency today was the New Zealand dollar which fell more than 1% on the back of weaker labor market numbers. Wage growth and average hourly earnings missed expectations while the ANZ commodity price index dropped to 2% from 3.7%. The steep sell-off in the currency drove AUD/NZD sharply higher especially after stronger Australian data. AU PMI Services was reported at 53.9 vs. 51.3 expected. AUD itself was unable to ride the wave of good data due to the strength of the U.S. dollar. Service sector activity accelerated and while activity in the same sector in China slowed, the composite index moved upwards. As Australia’s number one trading partner, the performance of China’s economy is extremely important. CAD on the other hand traded higher following mixed oil inventory data. US Crude Oil Inventories showed a surplus of 1413k vs. -1750k expected but the impact on oil was was offset by larger than expected gasoline inventory decline. Gasoline supplies fell by 3.3 million barrels, when a 200,000 barrel drop was expected. EIA also reported a production decline of 0.6% to 8.46 million barrels per day. The combination of these two factors drove oil prices and in turn the Canadian dollar sharply higher. No data is expected from Canada or New Zealand but Australian retail sales are scheduled for release this evening.